Mastering SolidWorks is the reference-tutorial for all users. Packed with step-by-step instructions, video tutorials for over 40 chapters, and coverage of little-known techniques, this book takes you from novice to power user with clear instruction that goes beyond the basics. Fundamental techniques are detailed with real-world examples for hands-on learning, and the companion website provides tutorial files for all exercises. Even veteran users will find value in new techniques that make familiar tasks faster, easier, and more organized, including advanced file management tools that simplify and streamline pre-flight checks. SolidWorks is the leading 3D CAD program, and is an essential tool for engineers, mechanical designers, industrial designers, and drafters around the world. User friendly features such as drag-and-drop, point-and-click, and cut-and-paste tools belie the software’s powerful capabilities that can help you create cleaner, more precise, more polished designs in a fraction of the time. This book is the comprehensive reference every SolidWorks user needs, with tutorials, background, and more for beginner to advanced techniques. 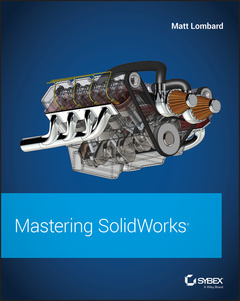 Work through this book beginning-to-end as a complete SolidWorks course, or dip in as needed to learn new techniques and time-saving tricks on-demand. Organized for efficiency and designed for practicality, these tips will remain useful at any stage of expertise. With exclusive coverage and informative detail, Mastering SolidWorks is the tutorial-reference for users at every level of expertise. Matt Lombard is the author of all six SolidWorks Bibles as well as several video tutorials and the Dezignstuff.com blog. Since 1995 he has been a mechanical engineer, working in plastics design, microelectronic assembly, contract design, and CAD consultation. He uses SolidWorks every day in his job, and is known throughout the SolidWorks community.